In the second part of our BloggingPro End of Year Giveaway we are happy to interview Jeff Starr, co-author of the popular Digging into WordPress book. Some weeks ago we interviewed Chris and now it’s Jeff’s turn. We asked Jeff to dish up all juicy gossip he knows about Chris but more important to share his views on WordPress’ popularity, its marketshare and Expression Engine. Hello Jeff, thanks for taking time for our interview. You have become part of the select crew of ‘WordPress Rockstars’, how did you come to WordPress? I actually began on the WordPress path with b2evolution, which was a precursor to WordPress. At some point, there was a mass exodus from b2 to WordPress and I decided to go with the flow. Working with WordPress 1.2, I began designing many different themes, each of them pushing my knowledge as a designer and WordPress’ capability as a blogging engine. Back then, there was much that was not possible using default WordPress functionality, and at the time, the number and variety of plugins were far less than what we currently enjoy. So, achieving design goals required LOTS of WordPress hacking — themes, plugins, and even the core itself. Fortunately, the many talented individuals working within the WordPress community have, over the course of the past five years, helped WordPress evolve into a much more powerful and robust piece of software. With all of the time and effort that I have spent working with WordPress, I am stoked to see how popular it has become. This is one case where going with the flow turned out to be the right decision. ‘Digging into WordPress’ is hot commodity and seems to be the WordPress Bible right at the moment. We recently interviewed Chris here at BP, how was it to work with Chris? Any interesting things we should know about Chris? We have seen WordPress used for pretty much everything in recent years: shops, directory, CRM, event calendar, voting platforms. Is there anything WordPress can’t do? Well you have to remember that WordPress is only a tool for bloggers, designers, and developers to achieve their goals. To the average user/blogger, WordPress can indeed “do it all” because “all” consists of basic stuff like blogging, commenting, and advertising. For intermediate users/designers, WordPress can pretty much do it all as well. Many designers need a good dynamic platform for building new sites and themes, and WordPress does this perfectly. It is only when you begin to consider the needs of developers and advanced users that the limits of WordPress’ potential are reached. But even then, with the right knowledge, WordPress can be extended and customized to suit virtually any need. So I think it’s all relative and based on the ability of the user/developer to use WordPress in such a way as to achieve their design goals. The question isn’t so much “is there anything WordPress can’t do?” as much as it is “is there anything you can’t do with WordPress?” WordPress may always be a viable choice, but whether or not it is the most efficient and suitable choice is of greater importance. Do you think WordPress has cornered the market now or is there still place for another platform, and if what would it be? I don’t know if WordPress has “cornered the market” or not. As a WordPress author and developer, it’s certainly nice to think that WordPress is the most popular CMS/blogging platform in the world, but popularity alone doesn’t necessarily mean superiority. You have to keep in mind that the Web is a big place, and that there are many localized communities of bloggers, designers, and developers using a wide variety of different platforms, including everything from Habari and MODx to Expression Engine and Drupal. In these circles, WordPress may be entirely irrelevant, as time and effort is focused on whatever application the community happens to be using. There are many non-WordPress communities that are thriving and growing for many different types of CMS and blogging software. The Web is big enough for hundreds of thousands of different platforms, each with their own micro-community of supporters, developers and users. Remember, this is exactly how WordPress began, as a small, community-supported blogging platform. It’s only when you measure popularity on a global scale that WordPress may appear superior to other choices. But once you dig down and start looking closer at other communities, you will see that there is much life beyond WordPress. As a designer I suppose that you are always on the lookout for the new platform software. Who do you think could make an impact next year and is there something that could make a new platform stand out being a viable alternative to WordPress? I do like to experiment with other platforms, but there is rarely any reason to use anything other than WordPress. Usually I can get the job done with minimal effort, unless we start getting into complex user-management and role-based registration systems, for which something like Drupal or Joomla might be a better choice. As for viable alternatives, I think it all depends on the developer, project, and end-user. I have seen beautiful sites built with MODx, Habari, Textpattern, and even with hand-rolled platforms. If you find a good alternative to WordPress that will help you efficiently achieve your design goals, then by all means you should use it. People should not be mindlessly installing WordPress just because of its sheer popularity. It is interesting to ponder whether or not MODx, say, could ever be more popular than WordPress, but ultimately it’s more important that people are using the right tool for the job, regardless of how popular it is. This is one of the things that is so great about the Web — diversity is infinite and the possibilities are endless. We need to evolve beyond the sheep mentality. I am one of those always on the lookout for the ‘next software’ and have eagerly been awaiting Expression Engine 2. What do you think of the new license structure for EE? I like Expression Engine. I would like it even more if it were completely free. I think that not providing a free Core version is a bad move, but I suppose a 30-day demo will suffice to get a percentage of users on the hook. It also looks like they hiked up their licensing fees quite a bit, which is also not going to help attract new users. The new “Freelancer” option looks nice, but seems too restrictive for the price. In general, I think EE’s pricing structure is just a bit out of reach for mainstream users, who have no reason to pay for something that they can get for free with WordPress. I think this may be one of the reasons why WordPress is more popular than EE — because it’s free, and people like free stuff. Thanks for your time and we wish you a great 2010. We here at BloggingPro are looking forward to many more great tips and tricks from Perishable Press. Please tell us, should we get excited already about another book? Chris and I are already in the process of putting together the next update for Digging into WordPress, which will include new information and tricks for WordPress 2.9, plus some new theme-development techniques and maybe even a free theme or two. So lots of good stuff going there, and we have TONS of new ideas both for the book and the site. Along with producing high-quality web-design content at Perishable Press, Digging into WordPress is my primary focus. I have lots of ideas for books and other projects, but unfortunately I only get 24 hours a day like everybody else. Thanks again for the interview! Much success to you and your readers in 2010! We have 3 copies to give away for our readers. Winners will receive a free version of the Digging into WP PDF with free lifetime updates and a discount on the printed version. To participate to today’s competition and win one of the three books by Jeff Starr and Chris Coyier, follow follow BloggingPro on Twitter (we will check) and leave a comment with your Twitter ID below or follow us and tweet about the BloggingPro giveaway. Today’s competition will be closed on December 29th 2009 at 23:59PST. Another good interview to read Franky, thanks for that! 🙂 I have been thinking that I should grab a copy of Digging Into WordPress, for the simple fact that I don’t know everything under-the-sun so to speak. Plus the fact it’d just be interesting to most likely learn something new, that I can build on, and possibly implement into how I use WordPress today! I visit DigWP.com on a regular basis, and also enjoyed the recent post on PerishablePress.com with all those extra tips and tricks that didn’t quite make it into the book, good stuff indeed! 😀 Speak soon! Glad you enjoy the interviews and no pressure for future interviews, right? Right. Thanks Jon, glad to read that you enjoy the site. We will continue to work hard and are already working actively at more surprises for 2010. I already purchased this book but I would like to say it was a nice interview. I’m dying to read this book! I hope I’m lucky. Very informative interview and a very nice gift as a giveaway. Thanks. Here is my twitter ID: hideipuser. Happy New Year to everybody here. 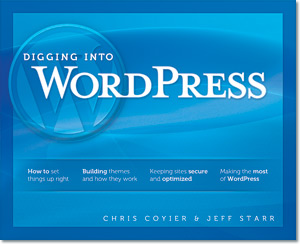 Another great WordPress book to own. I like that it is published by the writers themselves, gives them more freedom on how the book is done. Count me in! Great interview! I just found this blog via twitter and this giveaway. Lots of good stuff here, I cant wait to look around some more, I love finding new blogs for daily reading.